Nestled between Breakheart Hill and Bennett's Point is the village of Champney's West in Trinity Bay. Across the Tickle from Champney's West is Fox Island, which is connect by an isthmus to the mainland. Within the isthmus is a deep freshwater pond, surrounded on either side by stony beaches. The pond itself is famous for being bottomless, one of several reportedly bottomless ponds in Newfoundland. The best known of these is probably Deadman's Pond in St. John's, one of the tales we tell as part of the Ghosts of Signal Hill program. Legend holds that the bodies of executed criminals were displayed on a gibbet at Gibbet's Hill. After a time the bodies were cut down and loaded into barrels. Upon being weighed down with rocks they were then rolled into Deadman's Pond. Deadman's Pond was believed to be bottomless, thus quickening their descent into hell. A direct portal to Hell in St. John's East? Gothic stuff indeed, and as firm a fixture of St. John's folklore as the miles of tunnels everyone knows are just waiting to be found underneath Water Street. Firm enough in fact to steel the determination of a film crew from Space: The Imagination Station, Canada's national science fiction and fantasy cable station. They arrived in St. John's several summers ago as part of a cross-Canada odyssey to explore the unexplained. After having invested in a boat rental and trolling Deadman's Pond, the adventuresome Torontonians demonstrated on national television what every Townie could have told them ahead of time, should they have felt so inclined. Deadman's pond has a bottom. It isn't even that far from the surface. While I personally have not plumbed the depths of the Fox Island pond, something tells me that it probably has a bottom as well. Well of course it has a bottom, and we all know it. Most of us accept that we live on a spherical planet, and the idea of a pit that truly goes on forever is fantastic. We live in an era where satellite technology allows us to map the ocean's deepest abyss, and unless NASA is holding something back, no direct entrance ways to Hell have been discovered. But legends like those of Fox Island Pond and Deadman's Pond continue to circulate, be retold, and find their way into tourist literature. Why do we continue to tell these tales, and why does the idea of a bottomless lake continue to hold such a grip on our collective imagination? Part of it must be the fact that Newfoundlanders love a good yarn, even those (or perhaps especially those) known to be less than one hundred percent accurate. But maybe it goes deeper than that, if you will pardon the pun. Legends and tales of bottomless pits, lakes, and ponds are almost universal. Lake on the Mountain Provincial Park near Kingston, Ontario has a bottomless lake. So does Budapest and the town of Agias Nikolaos in Crete. There is even a Bottomless Lakes State Park near Roswell, New Mexico. These lakes and ponds offer us tantalizing doorways to another realm. Sometimes this other realm is stated as in the legend of Deadman's Pond, and sometimes it is left unsaid. But peering into the reflective surface of a still body of water and wondering what lies beneath provides us with a link to the unexplained. Perhaps this is why they fascinate us. It is not so much that we think they actually are bottomless, but that part of us wishes that they might be. Photo credit: Deadman's Pond by John W.
Around 1835, one of the English clerks at the Newman and Company’s plantation in St. Lawrence on the Burin Peninsula suffered a rather untimely demise. Embalming of any sort was an impossibility in that far flung fishing station, so the unfortunate man’s body was preserved inside a puncheon of rum until the body, by that point well pickled, could be taken back to Europe for burial. While unusual perhaps by today’s standards, this practise was apparently not uncommon. The most famous of these pickled corpses was Admiral Horatio Nelson, who himself had a Newfoundland connection. In May of 1782, Nelson, in command of the HMS Abbemarie, spent several days in St. John’s. Nelson was not impressed with St. John’s, and in a letter home to England described it as a most disagreeable place. During his stay he spent most of his time courting the bottle at the historic Ship Inn, close to what is now the Crow’s Nest on Water Street. Thankfully, the Admiral turned down a post in Provincial Tourism, and left St. John’s. In true heroic fashion he was killed at the battle of Trafalgar in 1805, and was shipped back to England in a barrel of brandy. 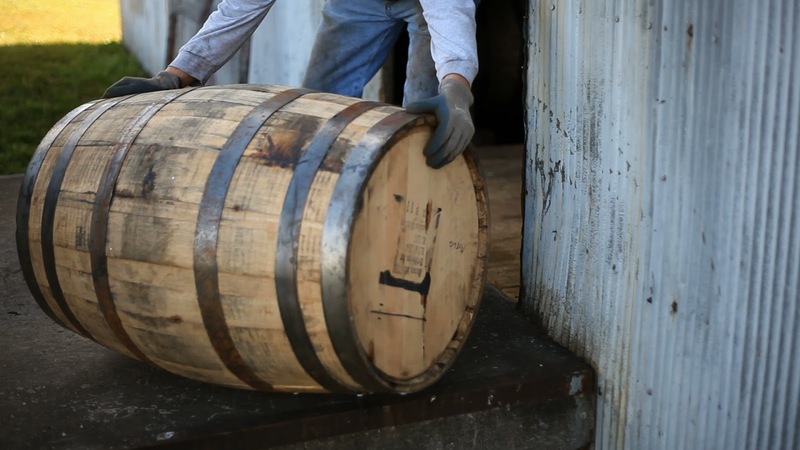 According to naval legend, when the barrel was finally opened it was found to be drained of its liquor. Apparently sailors unaware of the true contents had tapped it for some illicit tippling. These tales have a gruesome similarity to another story from the community of St. Lawrence, which apparently had a strange association with disturbing objects inside casks. The event in question shocked the community when the preserved corpse of an African baby was found sealed up inside a puncheon of molasses which had been imported from the West Indies. The delight of finding a body sealed up inside a container of one sort or another is reflected in a popular ghost story from downtown St. John's. Sometime around the 1870's, a married couple by the name of Packerson moved into St. John’s from a settlement in Conception Bay, and rented the house for two pounds four shillings a month. Mrs. Packerson always felt that she was being followed through the house and this made her feel very uneasy. The months slipped by and Mr. Packerson was offered a berth on a sailing vessel. It was barely a week after his departure when his wife had the horrifying experience of coming face to face with the house’s paranormal inhabitant. On that day, Mrs. Packerson had three times attempted to light the gas burner in the kitchen, and three times someone beside her blew out the flame. In a state of frenzy she turned to run from the kitchen but she was unable to move one inch. Directly in front of her, in what she was using a closet, she saw the figure of a woman standing in the doorway, illuminated with a dazzling brightness from the crown of her head to the very soles of her feet. Mrs. Packerson stared at the amazing spectacle for a few moments before realizing that she was actually gazing upon the figure of a ghost. When she realized what she was witnessing, she instinctively put her hands to cover her eyes and fell into a state of unconsciousness. When she revived, she ran to her neighbours, who informed her that a former owner had killed his wife, placed her body in a box, walled it up inside the closet, and had fled the country before the murder was uncovered. By the time the Packersons entered the story, they had been able to rent the house so cheaply only because the place was known to be haunted by the unhappy spectre of the murdered bride. The ghostly horseman spotted by Icabod Crane in Washington Irving’s classic tale “The Legend of Sleepy Hollow” may be the world’s most famous headless ghost, but the mythical Sleepy Hollow is not the only location to boast such a creature. Tales of headless horsemen and other headless phantoms can be found all over the world, from North Carolina to the community of Croydon in the United Kingdom. We can all be proud of the fact that Newfoundland and Labrador ranks right up there with other haunted locations around the globe when it comes to headless ghosts. Travelling along Labrador's northeast coast in 1995, I was told stories of a strange man without a face who haunted the now abandoned community of Hebron, Labrador. I once collected a story from a man in Heart’s Content who saw two headless monks. And Newfoundland author Robert Parsons once shared a story with me of a headless ghost from a spot called the Spring Well, in Lawn on the Burin Peninsula. That phantom was rumoured to return to the Spring Well each year, forever searching for its missing head. The oldest recorded St. John’s haunting that I know of dates to around 1745, and true to form, a headless ghost takes centre stage. According to local legend, Samuel Pettyham was a St. Johnsman who rented a small house at the end of a lane off Queen's Road. Pettyham had been visiting a friend in the west end of town. As it was late, his host offered to drive Pettyham home in his carriage. As the horse drew near to the laneway, it stopped suddenly, and refused to move an inch further forward. Pettyham offered to walk the rest of the way. About twenty yards along, a spectral figure stepped out into the moonlight. Pettyham took one look, and turned and fled in absolute horror. The figure he had seen was that of a very tall man, missing his head. Pettyham raced back up along Queen's Road, burst into a boarding house, swearing he would never spend another night in his house. 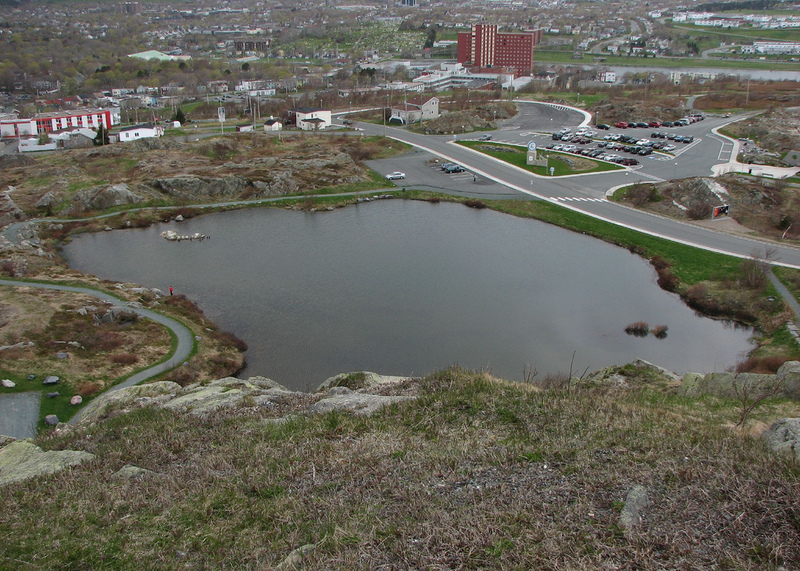 As if one headless ghost is not enough, Signal Hill boasts two. One legend concerns the ghost of Tommy Connor’s Gate, a story which has been circulating Signal Hill for at least sixty years. Tommy Connor’s Gate was located right across from where the Battery Hotel now stands. The property had at one point been farmland owned by the Barnes and the McGrath families. The original farm house had been torn down in the long forgotten past, but the gate had remained for many years. The gate was a big wide one which would open up to allow a cart to pass through, with concrete posts on either side. While there was nothing special about the gate itself, the ghost that appeared alongside it was another matter. People would see the ghost of a man standing by the gate, missing his head, but holding his hat in his hand. As a result, everyone was scared to pass it. While the gate was named after a local man, no one was certain who the ghost was exactly. It was believed it was the spirit of a man named either Fitzgerald or Fitzpatrick, who died (or was possibly killed) on the spot. In life, he had been known to stand by the gate or to sit on a little chair alongside it, looking after his property. Much more frightening was a different spirit, believed to haunt another location on the historic hill. That ghost was said to be the spirit of a huge African pirate, missing his head. Pirates, it seems, were forever losing their heads in Newfoundland and Labrador’s days of yore. Indeed, headless buccaneers seem to be rather common figures on our foggy shores. 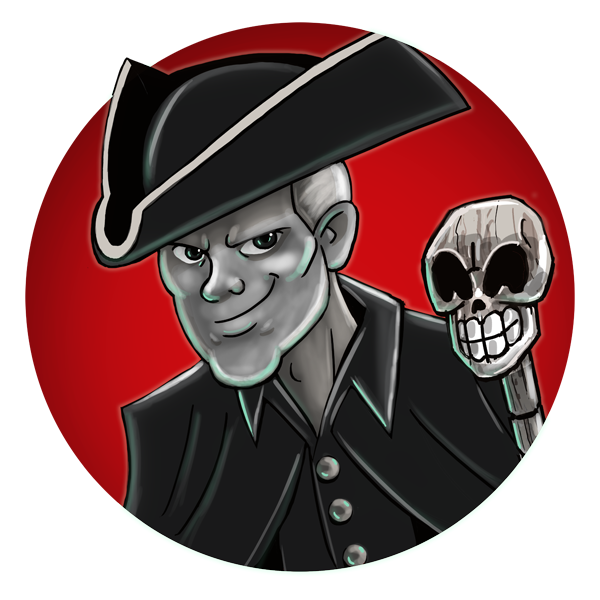 Many a community claims to have a pirate ghost, minus his noggin, guarding yet-to-be-discovered chests of gold. Lower Island Cove is one example. Its headless pirate was said to haunt a spot known to locals as The Featherbed on the north of Flambro Head. In the days before electricity, The Featherbed was said to be a rather foreboding place, often wreathed in mist and fog. 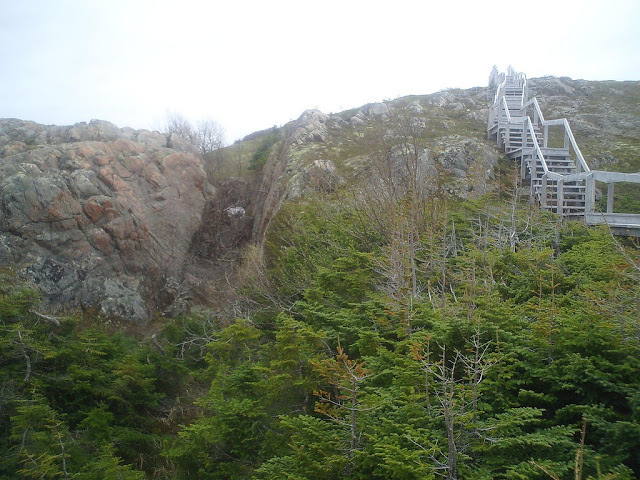 Newfoundland's long, unprotected shoreline with thousands of bays and inlets made it a perfect hiding spot for pirates in the sixteen and seventeen hundreds. While it was far from the gold-rich shipping lanes of the Caribbean, the fishing communities of the island were easy pickings for battle-hardened pirates. As well, its position at the mouth of the St. Lawrence River made it a good base of operations to raid ships sailing to the colonies of New France and Nova Scotia. 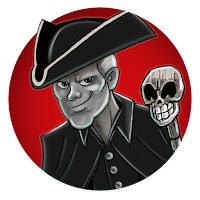 Such a rich history of piracy gave rise to countless local legends of pirate gold and ghostly guardians. One of my favourite of these tales is from Red Bay, Labrador. In 2003, the town constructed a new walking trail up over Tracey Hill. If you climb the 689 steps to the top of Tracey Hill and look around, you will be rewarded with an amazing panoramic view of the town and the coastline. If you are lucky, you might spot a ghost, and if you are truly blessed, you might find a buried treasure. The local folklore of Red Bay tells of the infamous pirate, Captain William Kidd, who was said to have hidden a treasure at the bottom of a small body of water known as the “Pond on the Hill” close to the summit of Tracey Hill. In the story, the pirate cut off the head of one of his crew, and tossed the body on top of the loot. The spectre of the unfortunate headless man was believed to appear at midnight, acting as the treasure’s ghostly guardian. The men of Carrol’s Cove quickly abandoned the search, and never returned. The event was such that no other attempts have been made to procure Captain Kidd’s treasure. Photo: the path to Tracey Hill, Red Bay, Labrador, by Dale Jarvis.